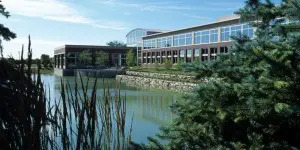 The Northern Illinois University Evening MBA offers flexible scheduling at the Hoffman Estates and Naperville campuses. The program is ideally suited for mid-career MBA candidates and usually takes about three and a half years to complete. Students may enter the program at the beginning of either the spring, summer, or fall semesters. Classes run Monday-Thursday evenings. The Evening MBA Program is divided into two phases. Phase One, which takes a minimum of 18 semester hours) is designed to make up for deficiencies in undergraduate course work or experience. This portion of the program is considered a prerequisite for the second program phase. Phase Two, a minimum of 30 semester hours, is exclusively graduate course work. Phase One and Two take 48 semester hours plus the colloquium block. Phase Two only takes just 30 semester hours plus the colloquium block to complete. Phase One must be completed prior to enrollment in Phase Two courses and Phase One coursework cannot be used as Phase Two elective credit. Credit earned during the completion of Phase One does not count toward the 30 or 31 semester hour degree requirement of Phase Two. All of the Phase Two requirements need to be successfully finished within six years of beginning the first Phase Two course. This includes work for which transfer credit is awarded. Basic competency in computer, mathematics, and communication skills are expected of students entering the program. Successful completion of MATH 210, Finite Mathematics or a first calculus course is expected prior to entry and can be readily taken at undergraduate or community college programs. 3) A “Pass” has been achieved on the first and only attempt of the Phase One exemption examination. Phase Two is designed to build on the foundations provided in Phase One through participation in individual and group research and case study project work. Strategic thinking and critical analysis of business problems is emphasized in the curriculum. There is required coursework in financial and operations analysis, strategic marketing and management policy, organizational behavior, and information system technology management. Phase Two consists of four blocks of coursework: an organizational behavior block, information systems block, business functions block, integrative capstone block, and three MBA electives. There is also colloquia requirement that must be fulfilled by attending any three non-credit colloquia at any time during the master’s degree program. The curriculum includes an international component option, which can be used to satisfy one of the three electives required for the degree through participation in an MBA-approved study abroad program. Previous trips have gone to Southeast Asia, Europe, and China. In the Northern Illinois University Evening MBA Program the mean student age is 32, with most students having had about 9 years of work experience. The average GPA is 3.17/4.0 and the average GMAT score is 542 in the program. Professional career counselors are available to help students and alumni with all facets of the job search. The Career Resource Center holds a walk-in resume review and also offers access to an array of job search information and databases. Finally, there are a number of on-campus career fairs hosted throughout the year. Evening MBA candidates are welcome to make use of these resources as their schedules allow. Total in-state program cost is $42,915.84 including Phase 1 (the program costs $26,822.40 excluding Phase 1 costs). Total out-of-state program cost is $60,051.84 including Phase 1 (the program costs $37,532.40 excluding Phase 1 costs). Northern Illinois University Evening MBA applicants are required to complete the online graduate school application, submit a $40 application fee, include two written recommendations from individuals who can reference your recent work achievements, a Goals Statement and an up-to-date skills-oriented resume. Additionally, all official transcripts from any associate, baccalaureate or other higher degree programs and official GMAT scores must be submitted. Transcripts from all relevant coursework is necessary for determining Phase One waivers and deficiencies, which determine and individual student’s program coursework. Students may also need to submit TOEFL or IELTS when applicable (international students). An undergraduate GPA of 2.75/4.0 and a GMAT score of at least 450 is required for admission. Business Information Systems and Business Statistics courses (or equivalents thereof) are also necessary for admission to the program. However, a GMAT waiver may be considered on an individual basis. Any applicant whose native language is not English must submit either TOEFL or IELTS testing scores. For the IELTS a score of 6.5 or above is necessary to be admitted. Alternatively, scores of at least 80 on the TOELF igb or 213 on the 0-300 scale are required for admission. Prospective students are encouraged to apply as early as possible.